One of the fun things I enjoy doing after I’ve had a good meal at my favorite Chinese restaurant is cracking open those little sweet cookies and reading my fortune from those tiny little slips of paper. Most customers don’t know that fortune cookies are considered dessert in Chinese restaurants. It is the last item that’s brought to my table on a plate with orange slices along with my bill (which is always written in Mandarin; however the amount I owe is clearly written in English). I glanced at it quickly then set it aside to crack open my cookie to find out my life’s fortune and future. I’m just a little curious to know whether or not I’m going to receive a million dollars in the morning or take that long and needed vacation to some exotic place or island. Maybe there’s some wise saying, truth, or word of wisdom to encourage me today? Whatever it is, I find it interesting how these sweet treats amuse and fascinate millions of customers. Some customers don’t even like or eat the cookies. They just want to read their fortune, not to mention using those little numbers on the back of the fortune to make lottery picks. Still others take this after meal ritual very seriously. I had a friend insist that it would bring me bad luck if I didn’t open the cookie and read my fortune. I had to think back to the many times I left my unread fortune on the table at the restaurant. Come to think of it my car broke down one evening just after I left a Chinese restaurant, and it had to be towed. I don’t remember if I read my fortune or not that night. Okay, I think I might be stretching this just a little. I can just see some of the saints getting ready to baptize me in anointing oil to cast out fortune cookie demons. Get thee behind me Satan! Lighten up, please. I haven’t completely gone off the deep end yet. I’ll be honest though. I have kept a few of these sayings on my desk. They just sound too good to throw away, especially the ones about becoming rich or wealthy. 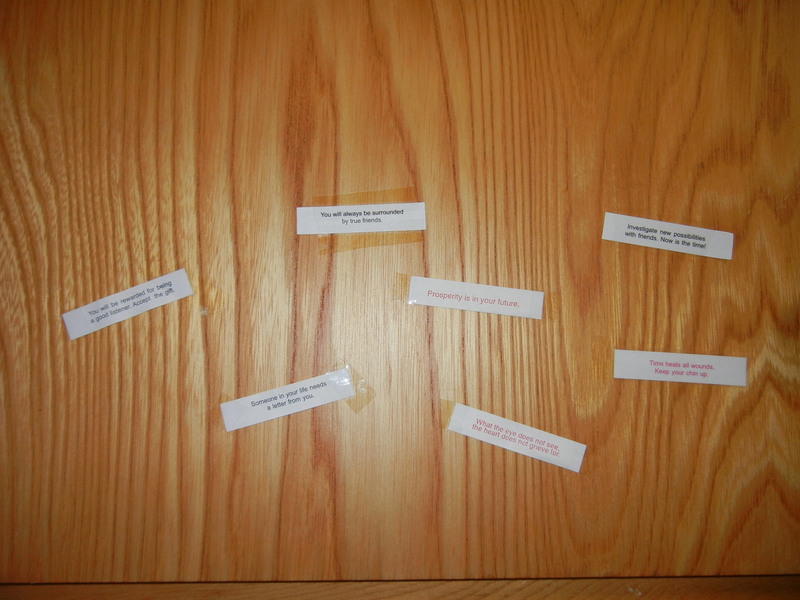 I have a good friend who pastes her fortunes on her food cabinet at home. There were times when I read my fortune and I thought to myself, “Wow, that’s dead on the mark! How did the little fortune cookie genie know this about me?” (I’m sure thousands of patrons to Chinese restaurants received the same or similar saying as I did.) How many times have you read something in book or magazine felt the author was writing to you? Or have you listened to a sermon and thought the minister had spoken with someone about your private and personal life? I am in no way suggesting that a fortune cookie can be placed in the same category as an inspirational author or sermon. Life is just too complex, particularly when we are in search for truth. Life is full of predictable and unpredictable situations and lessons learned that may seem universal in context to most of us. The search for some moral truth and meaning may often be found in places we least expected them. Yes, even sometimes in a fortune cookie, a poem, a song, a book, and even in grandma’s old wives tales. Some of these sayings however come from superstitious origins. Christians typically won’t admit they are superstitious, especially African American Christians. Edward T. Welch said, “Superstitions are personal routines you hope will bring good fortune or avoid bad.” There are many superstitions black people believe in that are deeply ingrained in Black culture. To this day, I’m afraid to open an umbrella indoors. Not because I fear bad luck but because I’m clumsy. I know I will knock something over or break something fragile. His Word is salvation. It is life changing, transformative, liberating, and it leads to life eternal. Jesus said, “You shall know the truth, and the truth we make you free” (John 8:32). He is absolutely true. “All roads do not lead to God. The Way of Jesus is not simply about an inwardly focused or otherworldly spirituality, or a social activism that is often viewed as its alternative. Rather, it is the Way of humility and self-denial for the sake of others. Denial of the unique nature of Jesus compromises the redemption accomplished through is life and death as well as the Way of life he models for us and calls us to follow” (Franke 2009). There are and have been many great men and women—philosophers, teachers, statespersons, and the like—who have espoused great moral truths in their work and lifetimes. I have learned many important and valuable lessons about life by reading great works of literature, philosophy, theology, fiction and nonfiction. In today’s world and culture, there are many who hold or doubt the existence of truth. While still others believe that all truth is relative. I do have the option of ignoring whatever is written on these little bits of paper just like I would some of the “I got a word for you” spoken by some so-called prophets. As a matter of fact, I’d rather take my chances on the fortune cookie than accept some of the predictions from many of these false prophets that seem to be popping up everywhere these days. Is it just harmless fun to read our fortunes or our daily horoscope in the newspaper or post them on Facebook? Should Christians be reading their fortunes from fortune cookies or their horoscopes from their daily newspapers? Should we take this as entertainment or are we dabbling in the occult? These are some of the questions I’m often ask from Christians seeking a deeper spiritual life and relationship with Christ. The short and simple answer is that I see many of these things as entertainment. The real danger is when we take these little slips of paper seriously and literally, or take the advice from our astrological sign as being some indirect word from God. Now I am not going so far as to say that you or I are dabbling in the occult. I am not that extreme in my views. I do take seriously, however, our need to have a disciplined life in prayer and fasting, and studying the word of God. I do believe God’s Word has all the answers I need for life and living. The problem for many of us is we often find ourselves in desperate situations and we want immediate answers or solutions to our problems. Most Christians are lazy. We don’t pray. We don’t enjoy the rich fellowship of the believers. We never seem to have time to read our Bibles, but we have plenty time to open our newspapers, magazines, or spend hours on our computers surfing the internet. We are like the children of Israel. We want to leave Egypt, but we don’t want to walk through the wilderness to get to our promised destiny. God gives a promise, but we are not willing to wait for it. Instead, we rather have the golden calf. When we seek answers for our lives outside of God’s Word, we should expect answers that are not His Word. So don’t be angry with God for things He never said or promised. You can relax now. I didn’t find truth or faith in a fortune cookie. I still enjoy going to Chinese restaurants and waiting for my Chinese dessert. Christians sometimes behave as unhappy or bewildered patrons who anticipate or expect good fortunes every time we come to God with a request. So, the next time you’re at a Chinese restaurant or before you start to read your daily horoscope, first asked yourself, “Did I read my Bible today?” David said, “Your word is a lamp to my feet and a light to my path” (Psalm 119:105, NKJV). And the Apostle Paul instructed Timothy to, “Be diligent to present yourself approved to God, a worker who does not need to be ashamed, rightly dividing the word of truth” (2 Timothy 2:15, NKJV). Lee, Jennifer 8. “Solving a Riddle Wrapped in a Mystery inside a Cookie.” The New York Times, January 16, 2008, Sec. Dining & Wine. Welch, Edward T. Running Scared: Fear, Worry, and the God of Rest. Greensboro: New Growth Press, 2007. Franke, John R. “Still the Way, the Truth, and the Life.” Christianity Today, December 4, 2009.